Summer is a time of exploration, of playing with what’s possible in the peak pulsation. As we build towards Summer Solstice, each day we are being gifted more light and energy with which to pursue the desires of our hearts and the dharma of our souls. In honor of summer, I’m adding a special Saturday series for June. Join me Saturday mornings, June 2 – 30th from 10-11:20am for an extra chance each week to explore community-centered and inclusive yoga for all. More here. This year is also a time of renewed commitment for me to the work of community-based and collective practices of healing. So I’m redoubling my efforts to get the skills and tools I need to take my own dharma to the next level. In this year, I am exploring training in two different approaches to yoga for trauma, along with a public health model for teaching trauma resilience, and embarking on a three-year (or more!) certification program in body-based trauma healing. So I’m reaching out to ask for your help with a small experiment. For nearly 8 years, I have centered my yoga offerings around a model I call “community-centered yoga.” And I’m hoping we can take that to the next level with Community-Supported Yoga. Similar to a Community-Supported Agriculture model, this approach asks you all – my community and my base – to support this work by paying for your yoga in advance. I’m offering a few Unlimited Options for June, for those who have the capacity and interest. These are only good for classes in June 2018, but I am offering 10 classes this month! And it’s the easiest way to support yourself and me – you get the motivation to do a bunch of yoga, I get the up-front financial support I need to fund my training efforts. I’m also offering multi-class passes priced at a sustainer model. All my classes are donation-based, and folks are still welcome to drop-in and pay on the sliding scale. These up-front class purchases, available in multiple increments and price points, are just another way for you to front-load your support for me while incentivizing your own participation in the life-giving practice of yoga. Finally, you can also just make a straight-up donation to support my efforts without expecting anything in return. This would, quite frankly, be amazing. If you’re interested, hop on over to my Square store! And I hope to see you on the mat. Class schedule here. Patty Adams is a bilingual clinical social worker, as well as an experienced yoga teacher and anti-oppression trainer. She is devoted to intersectional organizing, liberation, holistic healing arts, and wellness. 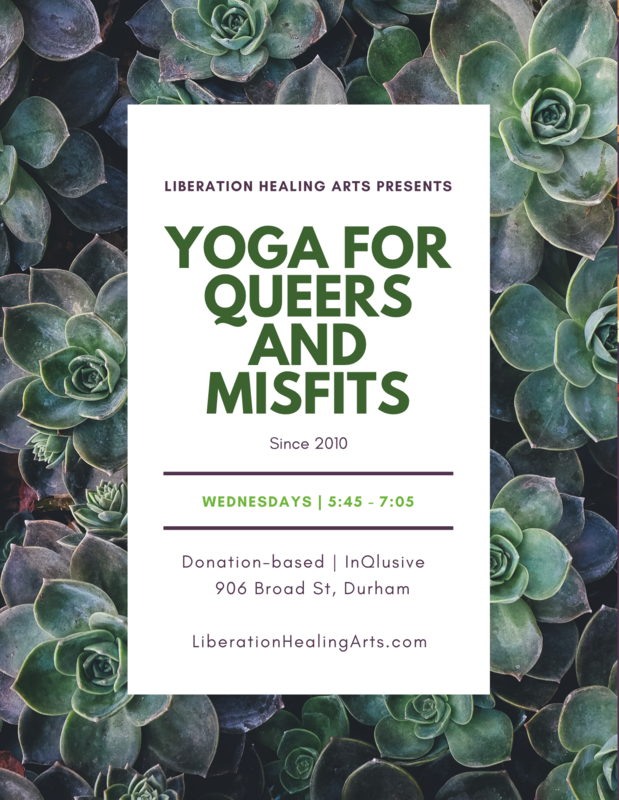 This entry was posted in Uncategorized and tagged accountability, anti-oppression, anti-racism, community supported yoga, community-care, intersectional, lgbtq, praxis, resilience, resistance, self-care, social justice, solidarity, somatic experiencing, trauma healing, yoga. Bookmark the permalink.